Keeping skin healthy can be a tricky proposition. Some seasons and activities make skin prone to dryness, while others can make it oily and prone to breakouts. Americans spend billions of dollars on skin creams that promise to clear up acne, moisturize, and even prevent skin from aging, but most of them don't work or contain harmful chemicals. Fortunately, there is an inexpensive, natural product that works to hydrate and balance skin, even clearing up acne without chemicals. Virgin coconut oil provides many healthy benefits to skin at a fraction of the cost of expensive creams and lotions. Many skin creams and cleansers, whether body lotions, moisturizers or facial cleansers, contain ingredients like parabens and mineral oil, which strip skin's natural oils and beneficial bacteria, then add oil back onto skin. The problem with this added oil is that it sits on top of skin, blocking pores so that moisture and nutrients can't be absorbed. The stripped skin is then prone to infection, dehydration and increased acne. Even products that say they help oily, acne-prone skin can actually make things worse. Oil free products usually contain a lot of alcohol, which does remove the oil but takes all the moisture with it. 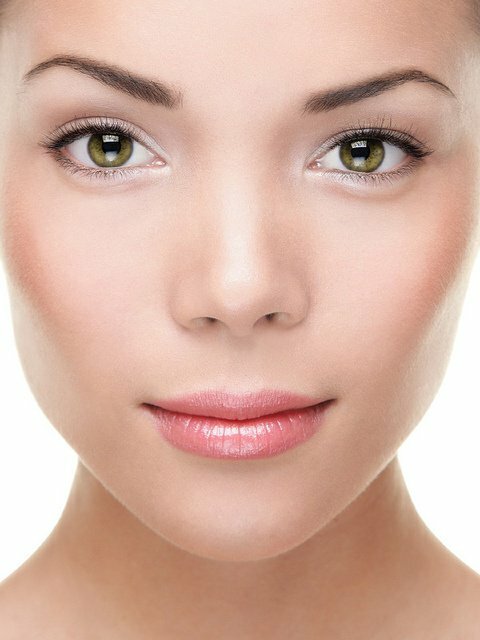 This can prompt skin to produce even more oil, which leads to more blocked pores and blemishes. On the surface, many people wonder how virgin coconut oil could work as a skin cleanser or moisturizer. Adding more oil to already oily skin seems like exactly the wrong thing to do. The truth is, however, that coconut oil works as a cleanser because of the chemistry principle that "like dissolves like." Coconut oil dissolves the oils blocking pores and causing acne, leaving skin clear. The oil then acts as a permeable barrier, keeping out impurities without blocking pores so that moisture can pass through. Coconut oil as a facial cleanser can be overused; a thin layer once or twice a day is plenty. Some skin care experts advise applying the oil, then covering the face with a steamy cloth for a few minutes to steam out impurities. After steaming, the oil is mostly wiped off the face, leaving a very thin layer behind for protection. Coconut oil contains many vitamins and nutrients, including antioxidants that heal and prevent skin damage. Skin redness and dark spots can both be reduced with regular use. Coconut oil also works as an anti-fungal and anti-microbial agent to help heal minor cuts, scrapes and rashes. Please consult your doctor before trying to treat any skin condition with coconut oil. Biconi offers 100% Cold Pressed Virgin Coconut Oil that can be used on the skin as a cleanser and moisturizer. Biconi's Radiant Skin Facial Cleanser also contains virgin coconut oil along with other plant extracts that nourish skin. Radiant Skin Facial Cleanser is a great alternative to plain coconut oil for those who want a more traditional cleanser for skin. These products can also work together, using the cleanser first and the coconut oil overnight to moisturize and balance skin.